Just print, laminate, and cut out. This is a center I use in my room all the time. It can be done independently, with a partner, or with a small group. I always have a set of Make a Sentence in the pocket chart on the back of my easel. That way, when the children finish with another center or any other classwork early, they can go to the pocket chart. I also have several sets in bags for a child to take back to his or her seat to work on. Each set contains 5 sentences to put in order. Each sentence is on a different colored background. The sets are color coded with a star on the front of each word card. That way, when (not if ) a lone card is found on the floor, one look tells you and the children which set it belongs to. There is a recording sheet for children to write some sentences they made at the enter. 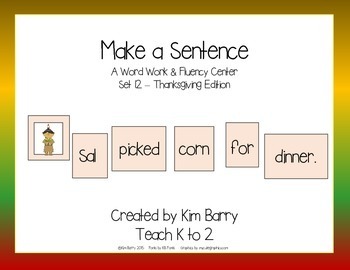 The sentences were made with simple, decodable names, words, and High Frequency words for reading ease. 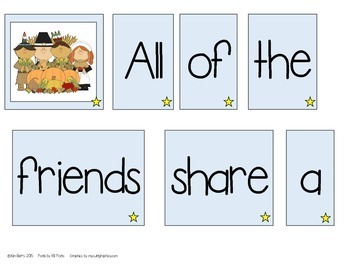 There are also seasonal or holiday words to help build fluency with those words. Each sentence has a picture to go with it. This helps the children get an idea of what the sentence is about. I hope your children enjoy this activity as much as mine do!